This is a short, fast-paced invasion map. Feel free to pause it and take a look at the scenery - not that there is much. You play the "settlers", where you shoot down the primitive savages knocking at your door and threatening your itinerant people. I found play ability for this scenario to be rather average. Either if you're attacking or defending you are bound to have trouble on higher difficulties. Normal is the best difficulty to play this map on due to low troop levels. This rating is because it's laughably easy on everything up to hard. Very Hard is where things actually get interesting. Which appeals to the veteran players. 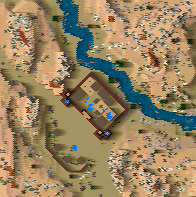 This average score is purely because this is a basic map that shows a little outpost in the old west defended and besieged with a medieval feel to it. Which is pretty intriguing. I liked the map design even if it does come across as being a little plain or monotonous. Because it actually does have a slight western feel to it. Since the style of the map was meant to be western and it was relatively accomplished map wise. I did like the story but there were absolutely no instructions which left me wanting. Additional Comments: Although this map is pretty basic it does have a western feel to it and therefore gets a reasonably average score. The scenario is fluid though the AI sometimes has trouble getting started with the siege it pulls the siege off beautifully at the halfway mark of the scenario. It's a western map with a medieval twist which is unique. Attacking is one thing I left out though. Whether or not you succeed depends entirely on the number of troops you have which is a little disappointing.